§ Kathleen M. Massie-Ferch, 47, died July 15, 2002, in Madison, Wisconsin, of breast cancer. She edited two DAW anthologies with Martin H. Greenberg, Ancient Enchantresses (1995) and Warrior Enchantresses (1996), and published a dozen or so stories in Marion Zimmer Bradley's Fantasy Magazine and various anthologies. Her webpage includes lists of her works and a biography. § Robert Randolph Medcalf, Jr., 52, died July 3, 2002, at his home in Biglerville, Pennsylvania. 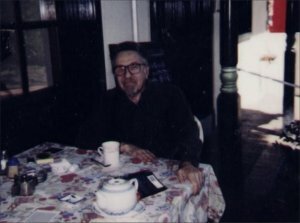 He published poetry and occasional stories beginning in 1976, many in Eldritch Tales and Space & Time. He founded Quixsilver Press in 1981 and in early 2002 founded online magazine Science Fiction Poetry Review, which includes a Publisher's Page about him. He published a poem in Strange Horizons in March. § Donald Franson, born 1916, died June 5, 2002, of heart failure, according to a report on SF Site. He was coauthor with Howard DeVore of A History of the Hugo, Nebula, and International Fantasy Awards (1978), and served several terms as president of the National Fantasy Fan Federation (N3F). § William L. Pierce, 68, died July 23, 2002, in West Virginia. He was an ex-rocket scientist, white supremacist, and author of The Turner Diaries (1978), a novel about a group of neo-Nazis who violently overthrow the US government, which was credited by Timothy J. McVeigh as inspiring the Oklahoma City bombing. § David Gemmell won this year's Prix Tour Eiffel for best SF/fantasy novel, for L�gende [Legend, 1984], in a ceremony in Paris on 14 June. The award, sponsored by the Soci�t� Nouvelle d�Exploitation de la Tour Eiffel, the company that maintains and operates the Eiffel Tower, includes a cash prize of 15,000 euros (= $16,000). Winners alternate each year between novels by Francophone authors, and translations from other languages. 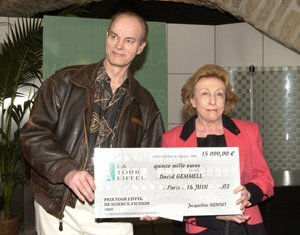 The photo shows David Gemmell receiving his check from Jacqueline Nebout, president of the Eiffel Tower company. The announcement on the Eiffel website is here in French, or translated by Google into English. § Greg Egan's "Reasons To Be Cheerful" and Ted Chiang's "Story of Your Life" have tied for Best Translated Short Story in the 33rd Seiun Awards, the Japanese equivalent of the Hugos. Results were announced at U-Con, the 41st Annual Japanese SF Convention, on July 14, and will be re-presented at a ceremony at ConJose, this year's World Science Fiction Convention. § The first Sir Julius Vogel Awards, for excellence in science fiction, fantasy and horror by New Zealanders, were presented last month during the national sf convention held in Wellington, NZ. Winners included Dale Elvy's novel First Hunter, Peter Friend's short story "The Good Earth", and dramatic presentation (long) The Lord of the Rings: The Fellowship of the Ring. § Winners of this year's Prism Awards, science fiction and fantasy romance novels, include Julie Moffett's Across a Moonswept Moor as "Best of the Best", and works by Sharon Lee & Steve Miller, P.C. Cast, Susan Squires, and Kathleen Kane in other categories. According to the BBC report, Pratchett said "I'm totally delighted and genuinely shocked," adding that he would have bet �1,000 that he would not win. "I'm especially pleased because Maurice isn't just fantasy but funny fantasy, too. It's nice to see humour taken seriously." During his acceptance speech at the Carnegie and Kate Greenaway Children's Book Awards at the British Library, Pratchett took swipes at fellow fantasy writers Tolkien and Rowling, according to The Independent: "Fantasy is more than wizards. For instance, this book is about rats that are intelligent. But it is also about the even more fantastic idea that humans are capable of intelligence as well. Fantasy isn't just about wizards and silly wands. It's about seeing the world from new directions." Both The Independent and The Guardian report further remarks from Pratchett about global politics, and the difficulty fantasy writers have in receiving recognition, especially from "high-minded librarians, editors and teachers, especially in the US, [who have] patronised and disparaged his work." § Organizers of the James White Award, a competition open to short stories by non-professional writers, have announced that this year's judges will be Orson Scott Card, Michael Carroll, Christopher Fowler, Graham Joyce and David Pringle. Closing date for this year's award is August 20, and the award ceremony will take place at Novacon 32 in November. 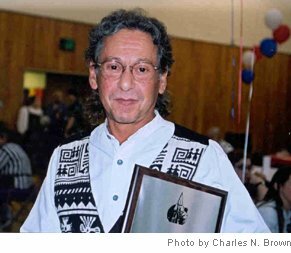 § Laurence M. Janifer, born 1933 as Larry Mark Harris, died Wednesday morning July 10, a week or two after being admitted to hospital with congestive heart failure. He was co-author with Randall Garrett of humorous SF novel "That Sweet Little Old Lady" (as Mark Phillips), a 1959 Astounding serial and 1960 Hugo nominee, published in book form as Brain Twister in 1962; as well as numerous other stories in Astounding (later Analog) from the late 1950s until January 2001. He was more recently noted for a series about interplanetary troubleshooter "Knave", including Survivor (1977), Knave in Hand (1979), and Knave and the Game (1987). His homepage is at http://soiuser.hyperchat.com/oudis/homepage.html. § Finalists for this year's Spectrum Awards, which honor works in science fiction, fantasy and horror that deal positively with gay characters, themes and issues, include novels by David Gerrold, Jacqueline Carey, Candas Jane Dorsey, and others, as well as nominations in short fiction and "other work" categories. Winners will be announced during this year's World SF Convention, ConJose, held August 29 - September 2. § Nalo Hopkinson's novel Midnight Robber received an Honorable Mention in the 43rd Casa de las Americas Prize for Literature, in the section for Caribbean literature in English or creole. § A new magazine, Bookmarks, will debut this September; it's designed for "media-savvy Gen-Xers who haven't really read a book since college but are eager to reconnect with literature, though uncertain how to do it," according to the LA Times report. The preview issue [not yet seen] includes "Sci-Fi author Connie Willlis's favorite science fiction stories".  The Eighth Annual PARSEC/Confluence Science Fiction and Fantasy Short Story Contest is now open to non-professional writers (those who have not met eligibility requirements for SFWA or equivalent). Judges are Charles Oberndorf, Mary Soon Lee, and Prof. Philip E. Smith. Deadline is February 1, 2003; send entries to Timons Esaias, Confluence Short Story Contest, 6659 Woodwell Street, Pittsburgh PA 15217-1320. For questions or clarifications only, send email to Esaias@compuserve.com. Standing: Tom Doherty (Tor), David Hartwell (accepting for Michael Kandel, Harcourt), Mark Kelly (for Gardner Dozois and Marc Resnick, St. Martin's), Tappan King (for Gordon Van Gelder, F&SF), Harlan Ellison (for Michael Whelan and Neil Gaiman), Jennifer Brehl (Morrow), Connie Willis; foreground: Michael Walsh (for Michael Swanwick and Old Earth Books), Marina Fitch (for Anne Groell, Bantam), Claire Eddy (for Ted Chiang, and Tor), Jacqueline Carey, Jennifer Hall (for Ursula K. Le Guin). Photo by Yeong Wang. 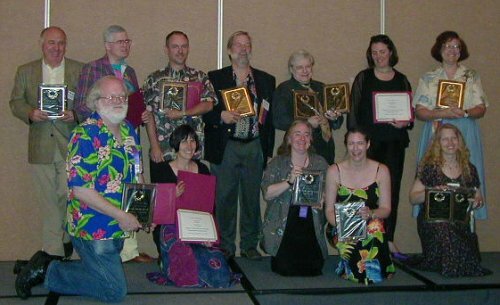  The 2002 Locus Awards were presented Friday evening, July 5, at Westercon in Los Angeles. The awards are given to winners in Locus Magazine's annual poll. Complete Locus Poll results will appear in the August issue of the magazine. Toastmaster at the awards banquet was Connie Willis. Only Willis, Jacqueline Carey, and Tor publisher Tom Doherty were on hand to accept their awards. In addition to the Locus Award plaques for the winners, certificates were given out to publishers of winning books and stories.  Jack Williamson's Terraforming Earth and Robert Charles Wilson's The Chronoliths (both Tor) tied for this year's John W. Campbell Memorial Award for the best science fiction novel of 2001, while Andy Duncan's "The Chief Designer" (published in Asimov's, June 2001) won the Theodore Sturgeon Award for the best short SF of the year. The awards were presented Friday evening, July 5, at the University of Kansas, according to James Gunn, director of the Center for the Study of Science Fiction. At the same event, Donald A. Wollheim, James Blish, Samuel R. Delany, and Michael Moorcock were inducted into the Science Fiction and Fantasy Hall of Fame (as previously announced). Williamson, who is 94, was unable to be present but sent a message of appreciation, saying that the award was particularly welcome because Terraforming Earth would be his final novel. Wilson was present to accept his award, as was Duncan. Third place in the Campbell competition was Nancy Kress's Probability Sun (also Tor). Runners-up in the Sturgeon competition were remarkable for both being published in the same issue of the same magazine as the winner: "Lobsters" by Charles Stross placed second, and "Undone" by James Patrick Kelly placed third. The Sturgeon Award stories are nominated by a committee of some two-dozen reviewers and editors chaired by Christopher McKitterick, with the winners chosen by Frederik Pohl, James Gunn, and Kij Johnson, with the assistance of Andros Sturgeon, from a group of about a dozen finalists. The Campbell Award novels are nominated by publishers and the winners selected by a committee of seven academics and authors chaired by Gunn and consisting of Gregory Benford, Paul A. Carter, Elizabeth Anne Hull, McKitterick, Pamela Sargent, T.A. Shippey, and Brian Stableford. § The Made In Canada Newsletter has posted a 2002 Prix Aurora Award Supplement, with links to online content, reviews, etc., for every item on this year's Aurora final ballot. § Ellen Datlow's latest online photos capture last month's KGB Reading in New York City with Constance Ash and Rachel Pollack.